SALE TIME IN THE JOHN ALVEY TURNER BANJO VAULT! We have parts, fittings, accessories and all manner of weird and wonderful hardware – some rare vintage but also new repro. We are pleased to offer a full restoration and repair service here at our Camden workshop, specialising in all manner of fretted stringed instruments, acoustic and electric. We stock, or can order in, a large range of parts and fittings to suit, or will make up new parts to order. We share our premises with renowned luthier, Michael Cameron, who also has many years experience working on bagpipes, woodwinds and many other types of musical instruments. Old school songs and instrumentals from America’s deep south. 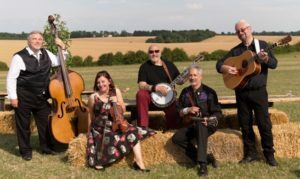 Three part harmony vocals with fiddle, banjo, mandolin, guitar and double bass. Available for concerts, festivals and private functions. For more than 200 years the name of John Alvey Turner has been renowned as a supplier of fine musical instruments. Today we are specialists in all kinds of acoustic fretted instruments – banjos, mandolins, guitars, ukuleles and all the many variations thereof. Whether your need is for a set of custom strings, a new, used or vintage instrument, restoration or repair work to the highest standard, or you are just interested in fretted instruments of any kind, we hope you will find something of interest in these pages. We regret that we do not provide free appraisals or valuations. If you require such information for insurance, probate etc., we need to see your instrument(s) or have detailed photographs and a note of any labels, maker’s name, serial numbers and the like. We charge a minimum of £20 per item for this service. FULL DETAILS ON REQUEST – SEE “Contact Us” Page. The John Alvey Turner company did not manufacture instruments and those that bear our name were usually custom made for JAT by a variety of other companies over the years. 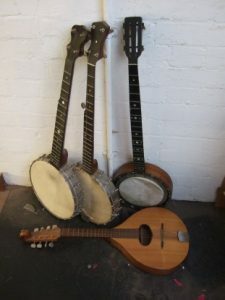 Early banjos (late 1800’s to WW1) were made by such as Weaver, Wilmshurst, Temlett, Cammeyer & Clifford Essex and later instruments by Windsor, Abbott, Sidney Young etc. A Bishopsgate address on the label indicates a date between 1900 and 1908. Unfortunately there are no records or serial numbers to confirm dates or makers although sometimes the workmanship, style, decoration etc indicates that an instrument was made by a particular individual or factory. JAT no longer has any original old parts or fittings for these or other vintage instruments but can supply new style or reproduction parts as available.